Jayme H. Mansfield is an author, artist, and educator. Her award-winning novels, Chasing the Butterfly and RUSH, are book club favorites and Amazon bestsellers. Her stories weave artistic, visual imagery with compelling plots and captivating characters. Romance, nuggets from the past, and timeless truths provide the fiber to make her novels rich and memorable. 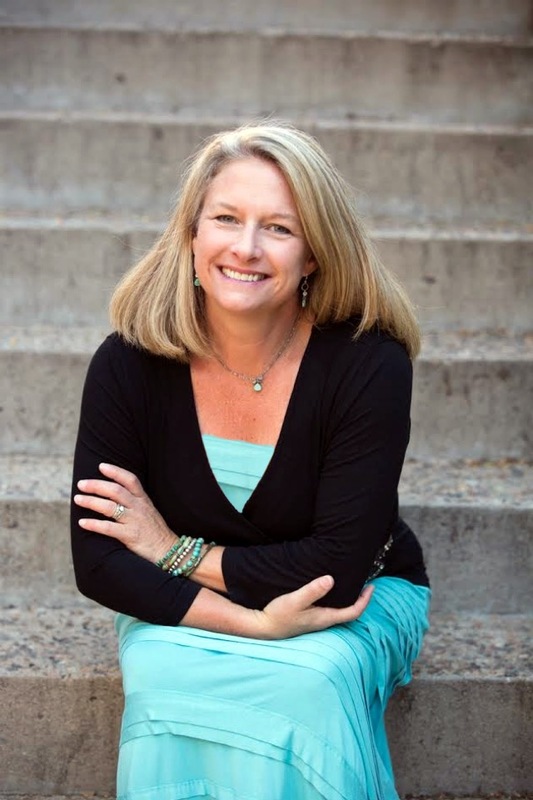 Jayme lives in Lakewood, Colorado, where she and her husband have survived raising three hungry, hockey-playing sons. Currently, a very needy Golden Retriever runs the roost. When Jayme isn’t writing, she teaches art to children and adults at her long-time art studio, Piggy Toes. I grew up hearing the tales about my great-great grandmother and her participation in the Oklahoma Land Run of 1893. Though deeply rooted in research and family history, RUSH is the fictional account of this determined and faithful woman who played a part in the making of the American frontier. I’m honored that RUSH won the 2017 Illumination Gold Medal Award for Christian Fiction and is currently one of three finalists for the prestigious Colorado Book Award. Here’s the back cover copy for a peek into the story and you can catch the beautiful book trailer at this link, https://www.youtube.com/watch?v=Lbdg6w0c3JA. Mary Louisa Roberts won the race of a lifetime … or so she thought. 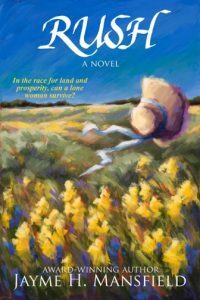 In competition with desperate homesteaders, ruthless land seekers, and a sheriff determined to see her fail, Mary rides out on a horse to strike her claim in the Oklahoma Land Rush of 1893. When she finally thrusts her flag into the dirt, 160 acres becomes her own. But with that claim, she risks more than she could ever imagine. A naïve school teacher and young mother abandoned by her hard-drinking, gold-seeking husband—whom she believes to be dead—Mary is faced with letting go of a past riddled with loss, hardship, and reminders that a woman isn’t capable of surviving on her own. Will Mary’s and Daniel’s stubborn and independent spirits keep them mired in the past? Or will two broken hearts find forgiveness and love in the wild plains of the Midwest? Historical fiction has a special place in my heart. I believe the past has a magical way of drawing us in—a reminder that we are a part of it. I also love the learning and wisdom that comes from researching for historical fiction. The bunny trails can become a tremendous distraction from meeting my daily word count, but oh, how fun the adventure! At my core, I am a storyteller and have been since I was a little girl. Once the spark was lit over ten years ago to actually write novels, my passion was solidified. I’m driven by the ever-present seeds of stories flitting around in my mind—characters, plots, settings, themes, and the need to make sense of life through expressing with words. Mary Louisa Johnston Roberts is actually the real name of my great-great grandmother. Often names are changed in fiction, but in this case, it felt right to use her given name and my relatives agreed. I don’t think she would have minded either as I believe the story does her justice. My favorite days are when I get up early, head over to my studio office, set the music, and write, write, write—often until the sun sets. On those days, when I have the discipline to ignore the demands of answering emails, posting on social media, and jumping on the plethora of marketing opportunities, I am in my most happy place. Admittedly, I like marketing and promotion and know it’s an essential part of being an author. Ideally, the days that I add quality and substantial content to my work-in-progress, and also tackle a handful of top priority business items, then it’s a day well spent. Striking this balance continually proves to be the most difficult part of being an author … oh, and waiting for responses from publishers and editors. Besides the moments when I am lost in the “writing zone” the friendships I’ve gained on this journey bring tremendous joy. From being the guest author at book clubs and speaking events, attending conferences, participating in writing groups, social media interaction, and simply chatting about writing one-on-on with a fellow book lover at a coffee shop, these relationships bring immense richness and fulfillment to my life. With the release of RUSH last fall, I hosted a western launch party at my art studio. I had no idea so many people would attend! The space was shoulder-to-shoulder with friends, family, and new acquaintances—all to support and celebrate a book—imagine that! I’m blessed to have the encouragement of many people, but to experience that level of support and love bowled me over. I’m proud that I’ve remained true and steadfast to my passion for writing books. It’s the hardest thing I’ve ever done, but I believe it’s my calling. Often not easy, but balancing being a wife, mother, daughter, friend, and enjoying my other passions in art and education, remind me of my many blessings. Time spent painting in my studio, walking my Golden Retriever, Bella, playing tennis, and reading for pleasure are the icings on the cake. As my three boys (17, 19, and 23) are nearly all out of the house, the shape and form of my days are changing. It’s sad, yet inevitable—perhaps more time for my husband and I to renew hobbies that have been stowed away in the midst of the madness with a houseful of hockey-playing, rowdy boys. Chasing the Butterfly is an award-winning, lovely story set in Paris and Provence from 1928-1960. It follows the life of an artist as her innocence of childhood slips away and love is lost and found Readers swear they can smell the lavender as pages turn! Seasoned, a slip-time romance from contemporary back to World War II through the Vietnam War, is complete and waiting patiently on several editor’s desks. My new endeavor is so exciting! I’m collaborating with a good friend who is in the business of art forgery detection and authentication of fine art to research and write a series filled with twists and turns, art history, and a fascinating female protagonist. My learning curve is to the moon while the story development is stretching every writing muscle.